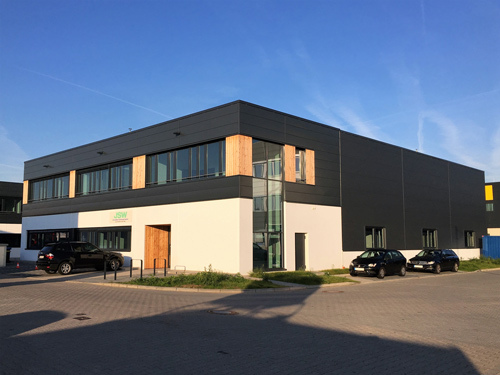 Extrusion Technical Center started sales operation in Dusseldorf, Germany since Jan. in 2017 and completed the ready of performance trial for customer since Sept. in 2017. The main equipment in Extrusion Technical Center is twin screw extruders for both compounding and devolatilizing trial. 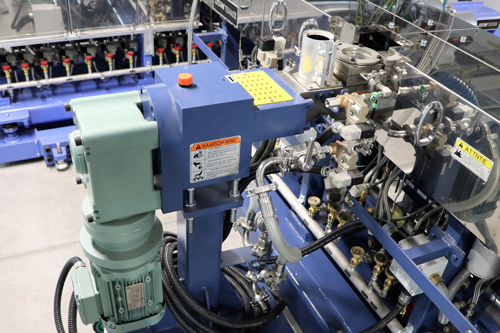 JSW’s latest twin screw extruder model “TEX44αⅢ” which has 18.2 Nm/㎝3 torque density (Td) is installed in Extrusion Technical Center for compounding and special reaction trial of high performance polymers, and model “TEX30α” is for devolatilizing trial, etc. 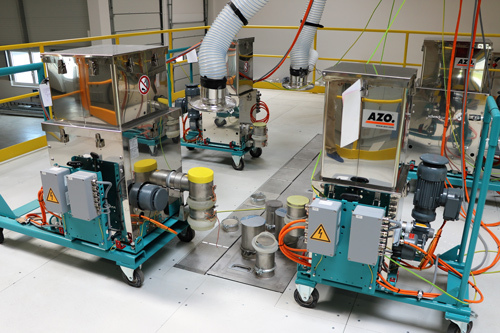 The Extrusion Technical Center complies with ATEX for solvent handling to achieve the process which is hard to deal with and high value. We provide the solutions for the customer’s challenges according to a lot of our special technology from accumulated many experiences. 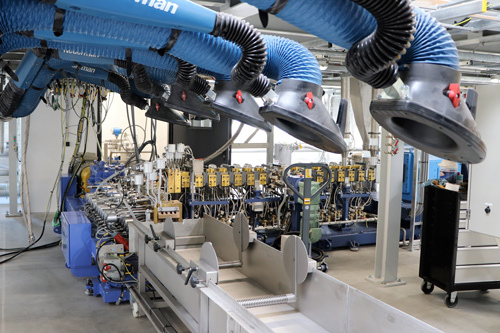 The Japan steel Works has global three (3) Extrusion Technical Centers in Hiroshima, Japan & Detroit, USA & Dusseldorf, Germany and we are sharing a lot of information regarding the polymer processing technology and timely customer support. 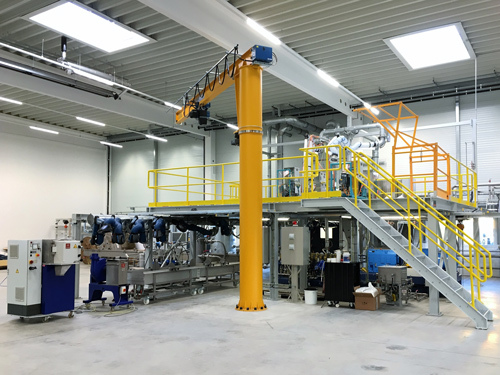 We focused the isolation process (devolatilizing and dewatering) and high-end compounding process such as high filled compound, super engineering plastic, TPV, biodegradable plastic, reactive processing and recycling. 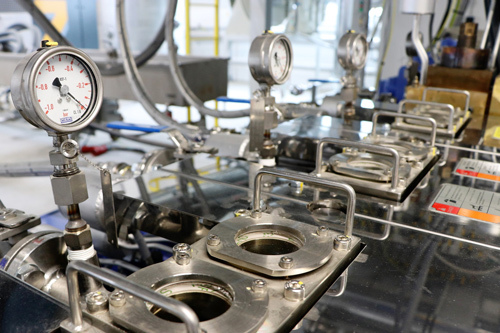 Regarding isolation process, we are especially focusing to devolatilizing process after polymerization such as the solution polymerization, the bulk polymerization, the polycondensation, etc. Dewatering process is also one of process for after polymerization such as the emulsion polymerization, the suspension polymerization and the solution polymerization (in case of rubber). Regarding the general compounding process, JSW and our subsidiary “SM Platek” cover flexible according to customer’ demands. The combination of TEX44αⅢ and TEX30α is used. 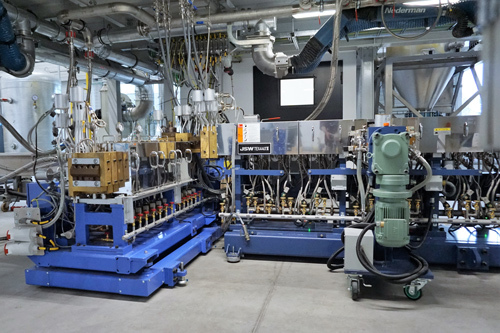 The layout of both TEX44αⅢ(1st extruder) and TEX30α(2nd extruder) is tandem, and 1st extruder is used for preparation of the solution (mixture of polymer and solvent). 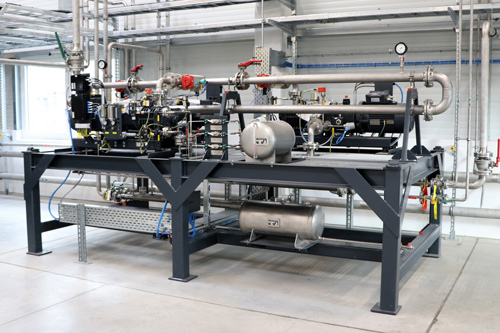 The polymer solution from 1st extruder is fed into 2nd extruder and then the solvent in the polymer solution is removed by vacuum pump. The removed solvent is condensed and recovered, and remained little amount solvent is burned by the incinerator, and then exhausted to outside of building safely. TEX44αⅢ is used for compounding trial. Various types of auxiliary equipment such as Gravimetric feeders, Liquid injection pumps, Vacuum pumps, Incinerator, Water bathes, Air knife, Strand pelletizer, De-dusting system, and Side feeder are available for the trial at Extrusion Technical Center. The top of each barrel can be opened and it means feed port and vent port can be move freely. SFD (Side feeder with vacuum degassing function) can be mounted on TEX44αⅢ for typical filler compound trial and its function is the compacting of bulky filler by vacuum during passage through the SFD.